An internship can lead to some tremendous opportunities. Not only does it give an intern the chance to gain firsthand industry knowledge, but they can learn a lot about their strengths and weaknesses, what they like and what they absolutely don’t. Sure, a great intern can boost your productivity, but they’ll give you some things that are even more valuable: a fresh perspective and the opportunity to inspire a career. 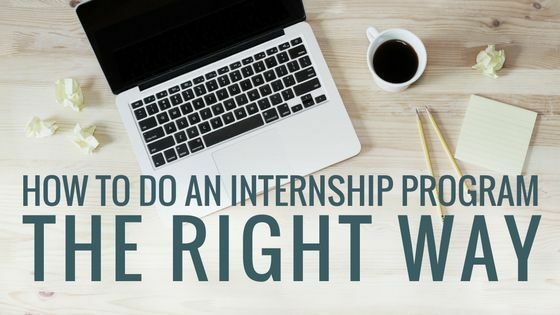 If your company is establishing an internship program, here’s some advice to help your intern get the most out of the experience. Get their foot in the door. A proper introduction is a critical part of an internship. Set up an orientation and lay down some ground rules. A dress code, company standards, and expectations should be addressed from the get-go. You want your intern to have fun and feel comfortable, but make sure they know they’re in a business environment and should be on their best behavior. Interns typically require more guidance and supervision than the average employee. Appointing a supervisor who is ultimately responsible for their tasks, schedule, and overall performance will relieve stress and help your intern with priorities. Your intern might be taking college courses, commuting a long distance, or going on a summer vacation and need some time off. Regardless of their situation, have a discussion with them about hours and figure out what works best for both of you. Please (we’re begging you) don’t send your intern on Starbucks runs. Keep them busy with legitimate projects. An intern is a great resource to help with your heavy workload, and it gives them a chance to get experience with a variety of projects and learn an eclectic skill set. No one ever learned anything valuable about business by getting coffee. So let them impress you. Your intern is dedicating their time to your business, so they should definitely be compensated beyond just school credit. Show them their value. Encourage them to bring their A game and make the most of the experience. Don’t just send your intern off with a “See ya!” on their last day. Take advantage of the opportunity to learn from them. Ask and understand what they liked, loved, and even dreaded. Getting some honest feedback will help you improve your program and provide an even better experience. Have advice for leading a successful internship program? Tweet us your thoughts @moproteam.